This article is about the Roman province. For the Gallic people for whom it was named, see Belgae. For other uses, see Belgica (disambiguation). Gallia Belgica ("Belgic Gaul") was a province of the Roman empire located in the north-eastern part of Roman Gaul, in what is today primarily France, Belgium, and Luxembourg, along with parts of the Netherlands and Germany. In 50 BC after the conquest by Julius Caesar during his Gallic Wars, it became one of the three newly conquered provinces of Gaul (known as the Tres Galliae (the 3 Gauls), the other two being Gallia Aquitania and Gallia Lugdunensis). An official Roman province was later created by emperor Augustus in 22 BC. The province was named for the Belgae, as the largest tribal confederation in the area, but also included the territories of the Treveri, Mediomatrici, Leuci, Sequani, Helvetii and others. The southern border of Belgica, formed by the Marne and Seine rivers, was reported by Caesar as the original cultural boundary between the Belgae and the Celtic Gauls, whom he distinguished from one another. The province was re-organised several times, first increased and later decreased in size. Diocletian brought the northeastern Civitas Tungrorum into Germania Inferior, joining the Rhineland colonies, and the remaining part of Gallia Belgica was divided into Belgica Prima in the eastern area of the Treveri, Mediomatrici and Leuci, around Luxembourg and the Ardennes, and Belgica Secunda between the English channel and the upper River Meuse. The capital of Belgica Prima, Trier, became an important late western Roman capital. In 57 BC, Julius Caesar led the conquest of northern Gaul, and already specified that the part to the north of the Seine and Marne rivers was inhabited by a people or alliance known as the Belgae. This definition became the basis of the later Roman province of Belgica. Caesar said that the Belgae were separated from the Celtic Gauls to their south by "language, custom and laws" (lingua, institutis, legibus) but he did not go into detail, except to mention that he learnt from his contacts that the Belgae had some ancestry from east of the Rhine, which he referred to as Germania. Indeed, the Belgian tribes closest to the Rhine he distinguished as the Germani cisrhenani. (Strabo stated that the differences between the Celts and Belgae, in language, politics and way of life was a small one.) Modern historians interpret Caesar and the archaeological evidence as indicating that the core of the Belgian alliance was in the present-day northernmost corner of France; the Suessiones, Viromandui and Ambiani as well perhaps as some of their neighbours who lived in the area, Caesar identified as Belgium or Belgica. These were the leaders of the initial military alliance he confronted, and they were also more economically advanced (and therefore less "Germanic" according to Caesar's way of seeing things) than many of their more northerly allies such as the Nervii and Germani Cisrhenani. Apart from the southern Remi, all the Belgic tribes allied against the Romans, angry at the Roman decision to garrison legions in their territory during the winter. At the beginning of the conflict, Caesar reported the allies' combined strength at 288,000, led by the Suessione king, Galba. Due to the Belgic coalition's size and reputation for uncommon bravery, Caesar avoided meeting the combined forces of the tribes in battle. Instead, he used cavalry to skirmish with smaller contingents of tribesmen. Only when Caesar managed to isolate one of the tribes did he risk conventional battle. The tribes fell in a piecemeal fashion and Caesar claimed to offer lenient terms to the defeated, including Roman protection from the threat of surrounding tribes. Most tribes agreed to the conditions. A series of uprisings followed the 57 BC conquest. The largest revolt was led by the Bellovaci in 52 BC, after the defeat of Vercingetorix. During this rebellion, it was the Belgae who avoided direct conflict. They harassed the Roman legions, led personally by Caesar, with cavalry detachments and archers. The rebellion was put down after a Bellovaci ambush of the Romans failed. The revolting party was slaughtered. Following a census of the region in 27 BC, Augustus ordered a restructuring of the provinces in Gaul. Therefore, in 22 BC, Marcus Agrippa split Gaul (or Gallia Comata) into three regions (Gallia Aquitania, Gallia Lugdunensis and Gallia Belgica.) Agrippa made the divisions on what he perceived to be distinctions in language, race and community - Gallia Belgica was meant to be a mix of Celtic and Germanic peoples. 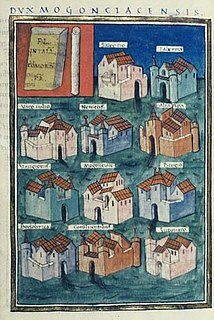 The capital of this territory was Reims, according to the geographer Strabo, though later the capital moved to modern day Trier. The date of this move is uncertain. Modern historians however view the term 'Gaul' and its subdivisions as a "product of faulty ethnography" and see the split of Gallia Comata into three provinces as an attempt to construct a more efficient government, as opposed to a cultural division. Successive Roman emperors struck a balance between Romanizing the people of Gallia Belgica and allowing pre-existing culture to survive. The Romans divided the province into four "civitates" corresponding generally to ancient tribal boundaries. The capital cities of these districts included modern Cassel (replaced by Tournai as Menapian civitas), Bavay (replaced by Cambrai as Nervian civitas), Thérouanne, Arras, St. Quentin, Soissons, Reims, Beauvais, Amiens, Tongeren, Triers, Toul and Metz. These civitates were in turn were divided into smaller units, pagi, a term that became the French word "pays". Roman government was run by Concilia in Reims or Trier. Additionally, local notables from Gallia Belgica were required to participate in a festival in Lugdunum (modern Lyon) which typically celebrated or worshiped the emperor’s genius. The gradual adoption of Romanized names by local elites and the Romanization of laws under local authority demonstrate the effectiveness of this concilium Galliarum. With that said, the concept and community of Gallia Belgica did not predate the Roman province, but developed from it. During the 1st century AD (estimated date 90 AD), the provinces of Gaul were restructured. Emperor Domitian reorganized the provinces in order to separate the militarized zones of the Rhine from the civilian populations of the region. The northeastern part of Gallia Belgica was split off and renamed Germania Inferior, later to be reorganized and renamed as Germania Secunda. This included the eastern part of modern Belgium, the southernmost part of the modern Netherlands, and a part of modern Germany. The eastern part was split off to become Germania Superior (parts of western Germany and eastern France) and the southern border of Gallia Belgica was extended to the south. The newer Gallia Belgica included the cities of Camaracum (Cambrai), Nemetacum (Arras), Samarobriva (Amiens), Durocortorum (Reims), Dividorum (Metz) and Augusta Treverorum (Trier). In 173 the later emperor Didius Julianus, then governor of Gallia Belgica, had to repel a serious invasion of the Chauci, a Germanic tribe that lived along the shores of the Wadden Sea at the respective northern and northwestern coast of present-day Netherlands and Germany, in the drainage basin of the river Scheldt (present day Flanders and Hainaut). Archaeologists have found evidence that large farms near Tournai and the village Velzeke (near Ghent) had to be abandoned. Further the capitals in the areas of the former tribes of the Atrebates, Morini and the Nervians were either burnt down (Nemetacum (Arras)) or had to be rebuilt in the last quarter of the second century, Colonia Morinorum (Thérouanne) and Bagacum Nerviorum (Bavay). With the Crisis of the Third Century and the partition of the Empire, Roman control over Gaul deteriorated in the 3rd century. In 260 Postumus became emperor of a breakaway Gallic Empire. He proved able to stop the incursions from the Franks. Only in 274 was Roman control restored by the new emperor Aurelian in the Battle of Châlons. The cost of this defeat in the long run proved very high indeed. With the Gallic army defeated and not returning to the Rhine border, the Franks overran the neighbouring province of Germania Inferior. The Rhineland (to the Ripuarian Franks) and the area between the Rhine and the main road between Boulogne and Cologne, present day South Holland, Zeeland, Flanders, Brabant and Limburg, the last three in both the present day Netherlands and Belgium (to the Salian Franks) were de facto lost forever for the Roman empire. This gave the Salian Franks a base from which they could expand some 130 years later, beginning after the disastrous Rhine crossing in 406, to conquer the whole area of the former province of Gallia Belgica and start the Merovingian kingdom, the first immediate forerunner state of Western civilization. Emperor Diocletian restructured the provinces around 300, and split Belgica into two provinces: Belgica Prima and Belgica Secunda. Belgica Prima had Treveri (Trier) as its main city, and consisted of the eastern part. The border between Belgica Prima and Belgica Secunda was approximately along the River Meuse. The eastern part of Gallia Belgica, especially the valley of the Moselle became very prosperous in the fourth century, particularly in the decades that Augusta Treverorum (Trier) was the capital of the Western Roman Empire. The Roman poet Ausonius wrote a famous poem on the Mosella. Around 350 Salian Franks who were already living in Batavia were settled in Toxandria. Toxandria was most likely for a large part overlapping with the area now known as the Kempen. Eventually, in 406, a large alliance among them Vandals, Alans and Suebi, under great pressure from the Huns, after first having been defeated by the Ripuarian Franks in the neighborhood of Cologne in Germania Inferior, successfully crossed the Rhine in the neighborhood of present-day Koblenz and entered Gallia Belgica by way of the Moselle valley. 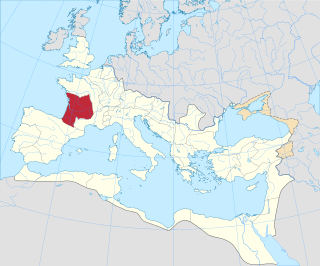 They subsequently destroyed large parts of Gallia Belgica, before eventually moving on to Hispania (present day Spain). This invasion and the accompanying widespread destruction broke the backbone of Roman power in at least the northern part of Gallia Belgica. After this invasion the Franks were able to conquer valuable agricultural land south of the Via Belgica, the very important main road between Cologne and Boulogne, that had been the backbone of Roman defense strategy between 260 and 406. In 452 a major battle was fought at the Catalaunian fields (between the Seine and the Moselle). A coalition of Romans, Visigoths and Franks fought an army led by the legendary Hunnic leader Attila. The outcome of this battle itself was inconclusive, but as a consequence of this battle the Huns and their allies left the area of Gallia Belgica where they had plundered nearly all major cities, except Paris. After the Western Roman Empire had already collapsed in Galla Belgica for some time the Gallo-Roman "Kingdom of Soissons" (457-486) managed to maintain control over the area around Soissons. The Franks however emerged victorious and Belgica Secunda in the 5th century became the center of Clovis' Merovingian kingdom. During the 8th century in the Carolingian Empire the former area of Gallia Belgica was split into Neustria (roughly Belgica Secunda, main cities Paris, Reims) and Austrasia (roughly Belgica Prima and Germania Inferior, main cities Trier, Metz, Cologne). After the death of Charlemagne's son, Louis the Pious, the Carolingian Empire was divided by the Treaty of Verdun in 843. The three sons of Louis the Pious divided his territories into three kingdoms: East Francia (the forerunner of modern Germany), West Francia (west of the Scheldt river) a part of which (Ile de France), from the middle of the 10th century became the kernel of modern France, and Middle Francia which was succeeded by Lotharingia. Though often presented as the dissolution of the Frankish empire, it was in fact the continued adherence to Salic patrimony. Lotharingia was divided in 870 by the Treaty of Meerssen under West and East Francia. 'Belgica Foederata' was the Latin name of the Dutch Republic. The name of Belgica continued to refer to the entire Low Countries until the modern period. The Seventeen Provinces of the Low Countries were then divided into the independent Belgica Foederata or the federal Dutch Republic and the Belgica Regia or the royal Southern Netherlands under the Habsburgian crown. For example, several contemporary maps of the Dutch Republic, which consisted of the Northern Netherlands, and therefore has almost no overlap with the country of Belgium, show the Latin title Belgium Foederatum. Belgica Foederata continued to be used as the Latin name of the Dutch Federation after its secession of Belgica Regia in 1581; the United Kingdom of the Netherlands after 1815 was still known as Royaume des Belgiques, and it was only with the independence of modern Belgium and the modern Netherlands in the 1830s that the name became reserved for Belgium to the exclusion of the Netherlands. ^ Gallia Belgica - Edith Mary Wightman - Google Boeken. Books.google.be. Retrieved on 2013-09-07. ^ Wightman, Edith Mary (1985), Gallia Belgica, University of California Press pages 12-14. ^ Gaius Julius Caesar. The Conquest of Gaul. Trans. S.A. Handford (New York: Penguin, 1982), pp. 59-60. ^ Gaius Julius Caesar. The Conquest of Gaul. Trans. S. A. Handford (New York: Penguin, 1982); pp. 59, 70, 72. ^ Matthew Bunson. Encyclopedia of the Roman Empire (New York: Facts on File, 1994), p. 169. ^ The Cambridge Ancient History, New Ed., Vol. 10 (London: Cambridge University Press, 1970), p. 469. ^ Edith Mary Wightman, Gallia Belgica (Los Angeles: University of California Press, 1985), pp. 57-62, 71-74. ^ Mary T. Boatwright, Daniel J. Gargola and Richard J. A. Talbert. A Brief History of the Romans (New York: Oxford University Press, 2006), p. 224. Ambiorix was, together with Cativolcus, prince of the Eburones, leader of a Belgic tribe of north-eastern Gaul, where modern Belgium is located. In the nineteenth century Ambiorix became a Belgian national hero because of his resistance against Julius Caesar, as written in Caesar's Commentarii de Bello Gallico. Gaul was a historical region of Western Europe during the Iron Age that was inhabited by Celtic tribes, encompassing present day France, Luxembourg, Belgium, most of Switzerland, parts of Northern Italy, as well as the parts of the Netherlands and Germany on the west bank of the Rhine. It covered an area of 494,000 km2 (191,000 sq mi). According to the testimony of Julius Caesar, Gaul was divided into three parts: Gallia Celtica, Belgica, and Aquitania. Archaeologically, the Gauls were bearers of the La Tène culture, which extended across all of Gaul, as well as east to Raetia, Noricum, Pannonia, and southwestern Germania during the 5th to 1st centuries BC. During the 2nd and 1st centuries BC, Gaul fell under Roman rule: Gallia Cisalpina was conquered in 203 BC and Gallia Narbonensis in 123 BC. Gaul was invaded after 120 BC by the Cimbri and the Teutons, who were in turn defeated by the Romans by 103 BC. Julius Caesar finally subdued the remaining parts of Gaul in his campaigns of 58 to 51 BC. 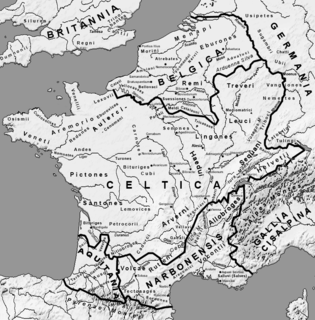 Gallia Lugdunensis was a province of the Roman Empire in what is now the modern country of France, part of the Celtic territory of Gaul formerly known as Celtica. It is named after its capital Lugdunum, possibly Roman Europe's major city west of Italy, and a major imperial mint. Outside Lugdunum was the Condate Altar, where representatives of the Three Gauls met to celebrate the cult of Rome and Augustus. Germania was the Roman term for the geographical region in north-central Europe inhabited mainly by Germanic peoples. The Nervii were one of the most powerful Belgic tribes of northern Gaul at the time of its conquest by Rome. Their territory corresponds to the central part of modern Belgium, including Brussels, and stretched southwards into French Hainault. During their 1st century BC Roman military campaign, Julius Caesar's contacts among the Remi stated that the Nervii were the most warlike of the Belgae. In times of war, they were known to trek long distances to take part in battles. Being one of the distant northern Belgic tribes, with the Menapii to the west, and the Eburones to their east, they were considered by Caesar to be relatively uncorrupted by civilization. Germania Inferior was a Roman province located on the west bank of the Rhine and bordering the North sea. The Roman provinces were the lands and people outside of Rome itself that were controlled by the Republic and later the Empire. Each province was ruled by a Roman who was appointed as governor. Although different in many ways, they were similar to the states in Australia or the United States, the regions in the United kingdom or New Zealand, or the prefectures in Japan. Canada refers to some of its territory as provinces. Gallia Aquitania, also known as Aquitaine or Aquitaine Gaul, was a province of the Roman Empire. It lies in present-day southwest France, where it gives its name to the modern region of Aquitaine. It was bordered by the provinces of Gallia Lugdunensis, Gallia Narbonensis, and Hispania Tarraconensis. The Belgae were a large Gallic-Germanic confederation of tribes living in northern Gaul, between the English Channel, the west bank of the Rhine, and northern bank of the river Seine, from at least the third century BC. They were discussed in depth by Julius Caesar in his account of his wars in Gaul. Some peoples in Britain were also called Belgae and O'Rahilly equated them with the Fir Bolg in Ireland. The Belgae gave their name to the Roman province of Gallia Belgica and, much later, to the modern country of Belgium; today "Belgae" is also Latin for "Belgians". The Tungri were a tribe, or group of tribes, who lived in the Belgic part of Gaul, during the times of the Roman empire. Within the Roman empire, their territory was the Civitas Tungrorum. They were described by Tacitus as being the same people who were first called "Germani" (Germanic), meaning that all other tribes who were later referred to this way, including those in Germania east of the Rhine river were named after them. More specifically, Tacitus was thereby equating the Tungri with the "Germani Cisrhenani" described generations earlier by Julius Caesar. Their name is the source of several place names in Belgium, Germany and the Netherlands, including Tongeren, and several places called Tongerloo, and Tongelre. The Eburones, were a Gallic-Germanic tribe who lived in the northeast of Gaul, in what is now the southern Netherlands, eastern Belgium, and the German Rhineland, in the period immediately before this region was conquered by Rome. Though living in Gaul, they were also described as being both Belgae, and Germani. The Vangiones appear first in history as an ancient Germanic tribe of unknown provenance. They threw in their lot with Ariovistus in his bid of 58 BC to invade Gaul through the Doubs river valley and lost to Julius Caesar in a battle probably near Belfort. After some Celts evacuated the region in fear of the Suebi, the Vangiones, who had made a Roman peace, were allowed to settle among the Mediomatrici in northern Alsace.. They gradually assumed control of the Celtic city of Burbetomagus, later Worms. Roman Gaul refers to Gaul under provincial rule in the Roman Empire from the 1st century BC to the 5th century AD. For around 450 years, from around 55 BC to around 410 AD, the southern part of the Netherlands was integrated into the Roman Empire. During this time the Romans in the Netherlands had an enormous influence on the lives and culture of the people who lived in the Netherlands at the time and (indirectly) on the generations that followed. The Caeroesi were a tribe living in Belgic Gaul when Julius Caesar's Roman forces entered the area in 57 BCE. They are known from his account of the Gallic War. They are generally also equated with the Cæracates mentioned briefly by Tacitus in his Histories. The Civitas Tungrorum was a large Roman administrative district dominating what is today eastern Belgium, and the southern Netherlands. In the early days of the Roman empire it was in the province of Gallia Belgica, but it later joined the neighbouring lower Rhine river border districts, within the province of Germania Inferior. Its capital was Aduatuca Tungrorum, which is modern Tongeren.